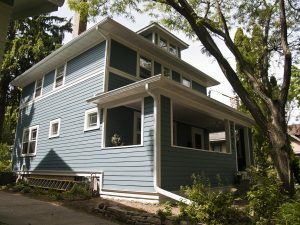 We used two different sizes of siding. James Hardie smooth 6 “ lower level and 4” on the upper level. All of this was done with a custom color. Then we accented it with Miratec smooth in White color. The Aluminum soffit, fascia and gutters were done in White for a complete Madison Siding renovation.